When I was a kid, a trip to the Purple Onion meant crossing at least one of two railway lines to find a lone diner sitting in the middle of them at Keele & St Clair. At the time, there wasn't much of anything else to visit in the area - unless you like railways and stock-yards -- but still every weekend the place would be packed with working-class people, kicking back with a coffee and Purple Onion's steak & eggs. Today, the area has been completely redeveloped, but the Purple Onion couldn't quite wait it out. 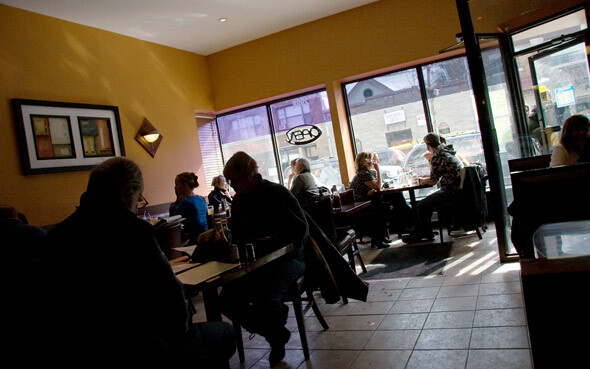 Owners made a move to the thriving Junction community a little while back and re-opened on busy Dundas West. Stopping in with a friend on Saturday, I have to double-check the sign out front. Goodbye wooden booths and soda-fountain -- hello leather seats and ceramic tile. While I wouldn't go so far as to call this fancy, the look is definitely sleek and modern compared to ye old Keele Street greasy spoon. We look over the menu and, inevitably, begin to wonder if the 'out with the old, in with the new' spirit has changed the food as well. 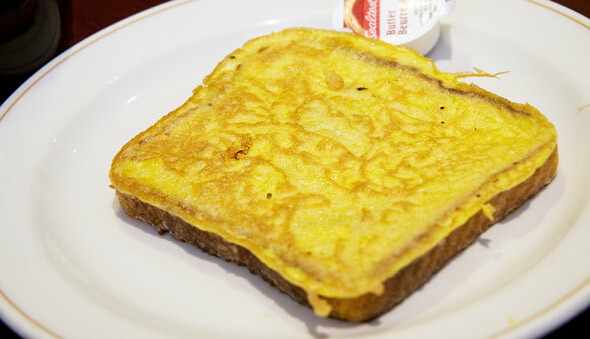 Starting off with sides of French Toast, we see the Wonder Bread style toast is still in vogue here. That's probably the only thing I would have liked to have seen changed, but nostalgia pours the syrup and we polish off our toasty tiles. 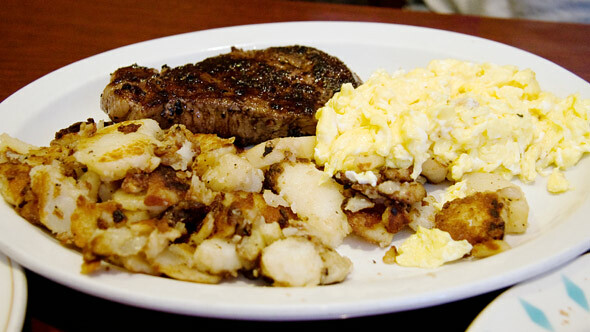 Next up, not the most photogenic of menu offerings but still the Purple Onion speciality: Steak & Eggs. It makes up for it all in flavour. Much like their East-end counterpart, The Tulip, the steak here is grilled to a scientifically precise medium-rare - just as we asked for - and the diner-style homefries are, "so awesome," as the kid at the next table points out to his dad. This simple 6 oz offering is a great deal for $7.95 and even comes with a side of buttered toast for you cholesterol addicts out there. For me, half the appeal of the Purple Onion was the vibe of the place -- something they've definitely lost in their new location. Still, the food is good, service friendly and the deals are impressive (did I mention bottomless coffee? ), making coming back here an easy decision.